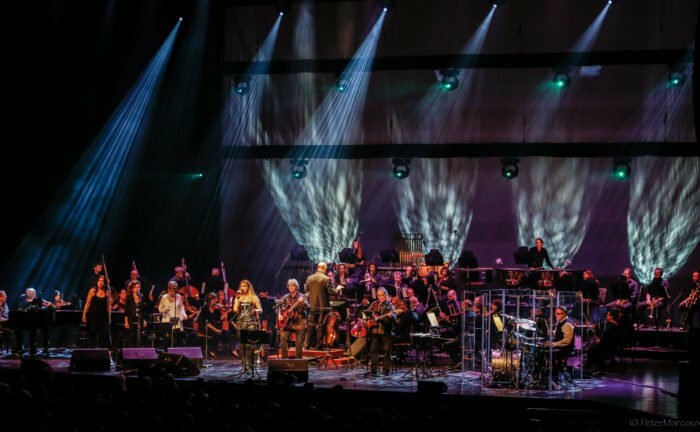 The Mansfield Symphony Orchestra will be joined by world-class rock musicians, Jeans ‘n Classics, to perform the music of Elton John in its OhioHealth Symphony Series concert, “Jeans ‘n Classics” on Saturday, March 23 at 8:00 PM at the Renaissance Theatre in Mansfield. Under the direction of Octavio Más-Arocas, the event will feature a dynamic program celebrating the music of Elton John in a unique collaboration melding rock music with symphonic. The members of Jeans ‘n Classics who will be performing with the Mansfield Symphony will be: Jean Meilleur, vocalist, John Regan, pianist, Jeff Christmas, drummer, and Mitchell Tyler on bass. Jean Meilleur has been a headliner with Jeans ’n Classics for over 20 years. In that time he has performed with scores of major North American orchestras, lending his distinctive voice to some of the greatest popular music of our time. Originally from Madison WI, Jean was born and remains a Green Bay Packer fanatic! He moved to Detroit MI at a young age. Living in the Motor City helped shape his penchant for the Motown, Soul and R&B sounds of the early ’70s. Jean is a prolific songwriter who has been performing professionally for over thirty years. His singing voice can best be described as passionate and provocative, with a robust timbre that is immediately recognizable. His voice stands as a true original. Jean’s voice has been heard over the years on many national radio and television jingles and advertisements. He was recently chosen as the Canadian voice of Jim Beam Kentucky Straight Bourbon Whiskey. John Regan has been a member of Jeans ’n Classics since the early 1990’s. Classically trained but conditioned by rock, pop and folk music, John’s repertoire is vast. Prior to joining Jeans ’n Classics he worked with Second City in London, Ontario and did solo work across southwestern Ontario. John cites Joe Jackson, Tom Waits, Elton John and Roy Bittan as influences. Since becoming a Jeans ’n Classics regular performer, John has shared the piano with such notables as Roger Hodgson (Supertramp), Lawrence Gowan (Styx), as well as his good friend Don Paulton (Lighthouse, Jeans ’n Classics). He has performed with more than 50 orchestras across North America. Jeff Christmas is a Canadian Composer, Arranger, Conductor, Drummer and Percussionist who studied at York University (Toronto) Western University (London) and Berklee College of Music (Boston). His extensive background and versatility encompasses the classical and contemporary worlds. He has conducted and performed with symphony orchestras across Canada and the United States, appearing with artists such as Denny Doherty, Michael Burgess, The Rankins, Ashley McIsaac, J.P. Cormier, Jackie Richardson, Martin Fry (“ABC”), and recently was conductor for legendary and multi-Grammy Award winning Michael Bolton. In 2004, Jeff was appointed conductor for a series of concerts at Canada’s Casino Rama with Roger Hodgson (formerly of “Supertramp”) and members of the Toronto Symphony Orchestra. He has appeared as a guest conductor with Tucson Symphony, Calgary Philharmonic, Fresno Philharmonic, Winnipeg Symphony, Roanoke Symphony, Thunder Bay Symphony, Victoria Symphony, South Dakota Symphony, Vancouver Island Symphony, Lansing Symphony, Springfield Symphony, Stratford Symphony, International Symphony, Lexington Philharmonic, and Jacksonville Symphony. Jeff was a frequent guest conductor with Orchestra London’s Pops, Red Hot Weekends, Education and Family Series, and various community concerts. Conductor, arranger, bassist and educator Mitchell Tyler is an Honours Bachelor of Music (Theory & Composition) and Bachelor of Education graduate of Western University, and has been a member of the Jeans ‘n Classics Band since 1992. As a performer he has shared the stage with many artists including Rik Emmett (Triumph), Alan Frew (Glass Tiger), Roger Hodgson (Supertramp) and Lawrence Gowan (Styx). He has recently played the touring productions of Chicago (2015) and Mamma Mia (2012). As a conductor, Mitchell has had the privilege of working with a wide variety of orchestras across North America. Recent guest conductor appearances include the Springfield Symphony, the Erie Philharmonic, the Duluth Superior Symphony, the Colorado Symphony, the Jacksonville Symphony and the Cleveland Pops Orchestra. He continues to immensely enjoy his work with the newly formed Jeans ‘n Classics Rock Symphony (2012). Tickets are on sale now for this concert at the Renaissance Box Office, via phone at (419) 522-2726, and online at MansfieldTickets.com. A limited number of $50 Family Four Pack tickets as well as $10 student tickets are available only by visiting or calling the Renaissance Box Office. Full-price tickets range from $15 to $40. The Mansfield Symphony’s “Jeans ‘n Classics” concert is presented in part thanks to funding from the Ohio Arts Council.